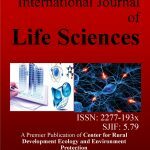 A Review of Pesticide Poisoning: Far reaching implications and the need for synergistic policy implementation in Gombe, Northeastern Nigeria. Exogenous Application of Salicylic Acid for Stimulates Germination, Growth and Yield Production of Wheat (Triticum aestivum, L.) Plant Under Water Stress. Factors Influencing Farmers’ Participation On Off Farm Activities: A Case Study in East Gojjam Zone, Ethiopia. Ethno-botany and Utilization of Fern and Fern-allies as Non Timber Forest Product in Darjiling Hills.